The Cooperative Fitness Challenge was tested with 4th and 5th graders but it can be adapted to be used by teachers who teach grades 3-8. It is a series of 6 fun and challenging fitness and cooperative tasks that if passed can earn participants a bronze (4/6 challenges successfully completed), silver (5/6), or gold (6/6) pin. Welcome to the Cooperative Fitness Challenge from PE Central and S&S Discount Sports. This awesome program features 6 challenges that will excite your children about fitness and encourage them to work together! 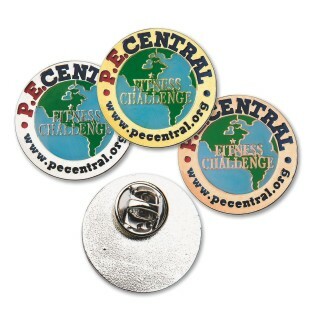 * Registration is FREE at the PE Central Challenges web site. Click on the program you are interested in joining. * After you become a registered member, you can start and stop the challenge any time you wish with your kids. Then return to the site and order your pins. Upon completion of the program, you can order Challenge award pins from the S&S Discount Sports website and receive 15% off plus FREE shipping on orders over $25. Use offer code B4260 when ordering.